Fashion is one of the reasons I go online (next to earning online). I love browsing through different fashion websites, reading blogs and even buying stuff from Ebay. Because of the accessibility of the information online, I have decided to cancel my subscription to a fashion magazine. First, I can view collections even before they are released in media.Second, I get to read reviews from fashion enthusiasts regarding certain product or collection. Third, I get to compare prices and see if the item is worth buying. DigitalFilipino Janette Toral interviewed public relations specialist Ram Lopez - Vito Bucoy (http://twitter.com/Rambuc) on how fashion entrepreneurs can approach traditional media and bloggers to promote their products. The voice of fashion bloggers is so loud as evident in the hype of Forever21's opening. Some famous fashion bloggers were invited to the pre-launching and pre-opening sale of the store, that alot of followers and fans eagerly followed their sites for updates on what to buy, and what to expect. It was not a surprise that during the opening of Forever21, crowd was already lining up as early as 7AM in Megamall, that some were even running on their way as if there is some sort of race or fun run. I agree with Ram, that stores and brands may tap into bloggers to promote their collection and products. Take for example, the Larry Alcala's Collection released by Solo. If one would search the following words in Google - Solo, Larry Alcala - the results would show a list of fashion bloggers' sites who had participated in the campaign. The goal was met, and I, as a consumer even considered purchasing the product. Fashion Blogging is a way of expressing one's style and individuality. Fashion Blogs have become popular wherein bloggers share their latest look and ensemble - be it in the party, at work or just plain doing the grocery. Oftentimes, their look where even borrowed by fashion magazines where these bloggers' style are usually featured. It seems that fashion magazines and mannequins are no longer the main source for fashion inspirations. Chictopia is a popular online fashion community where members share their looks and get rated for their style. These Fashion Blogs are very helpful in sharing information, specifically, where to buy cheap items, what to wear in a particular occassion or simply what to pair with your orange shoes or purple ties. Fashion Blogging doesn't stop with just sharing what you wear and where to buy them. 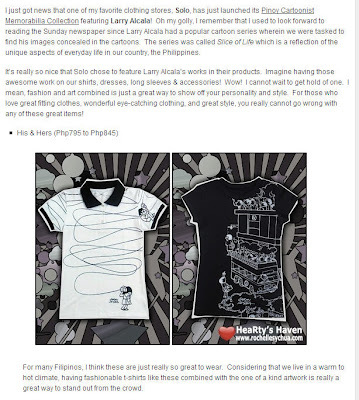 One popular site, like the Ukay Queen is offering more than just fashion views, but an online store too. It only means that fashion blogging doesn't just end with sharing your style, but it may open doors to bigger opportunities like business, or even modelling (some fashion and beauty bloggers where even invited to become fashion ambassadors). Now, the question is how fashionably you would maintain your Fashion Blog to keep your followers? I think, you have to be part of the conversation and thank social media.